I just returned from a short trip (my tenth) to Galapagos. 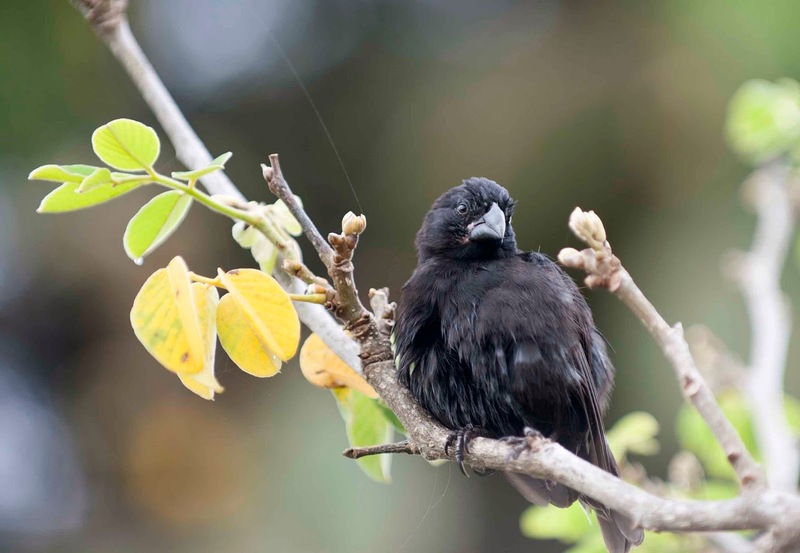 New experiences during the trip prompted further speculations on a phenomenon we had earlier described: human influences on the adaptive radiation of Darwin’s finches. An oft-repeated mantra is that remote oceanic islands (never connected to the mainland) are natural laboratories for studying evolution. Part of the reason is that they tend to be simple environments, making it easier to disentangle otherwise overly-complicated ecological and evolutionary relationships. One way in which islands are simple is that they often lack human populations, which contributed to the evolution of strange forms that proved to be utterly unsuited for a life with colonizing humans. As a result, the settlement of remote islands by humans often leads to the extinction of local life forms. However, not all isolated populations go extinct when humans colonize, instead they often evolve to suit the new conditions. A spectacular male Darwin's finch. My own foray into island life involves Darwin’s finches in Galapagos. This work obviously follows closely from the insights and work of Peter and Rosemary Grant, and was made possible by an impromptu postdoc I did with Jeff Podos at UMass Amherst. 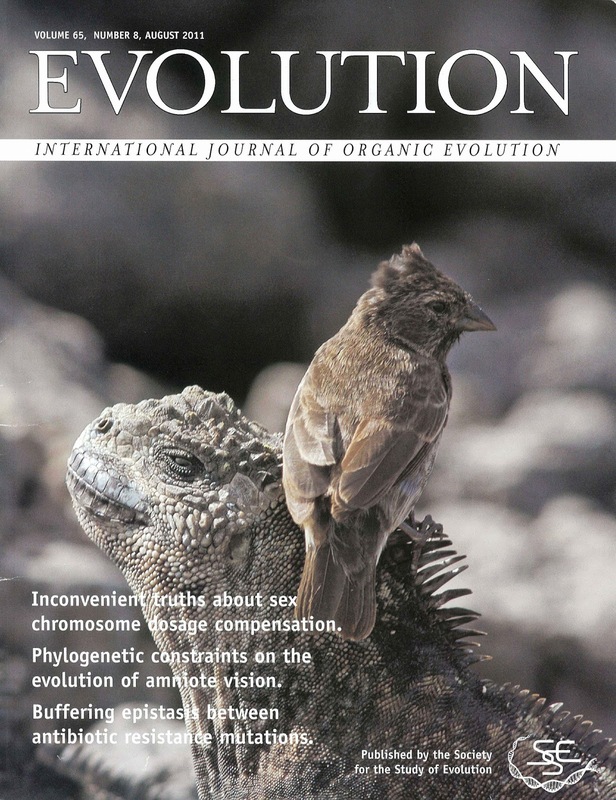 In general, the adaptive radiation of Darwin’s finches is thought to have been driven by specialization of different species on different food types, which has led to reproductive isolation (speciation) through assortative mating by beak size (beaks, songs, and mate preferences are all linked) and natural selection against hybrids (which are poorly suited for either parental diet). With respect to this last point, different “adaptive peaks” are thought to exist in the Galapagos as a result of different food types. For example, large-beaked species evolve to use large/hard seeds and small-beaked species evolve to use small/soft seeds but intermediate beak sizes are rare because intermediate seeds are rare. (I just made and posted a video illustrating this phenomenon.) Darwin’s finches thus diverge onto different adaptive peaks and the few hybrids they produce have intermediate beaks that lack appropriate intermediate seeds on which to feed, and therefore suffer low survival – thus keeping the two species separate. Yum - a native food! 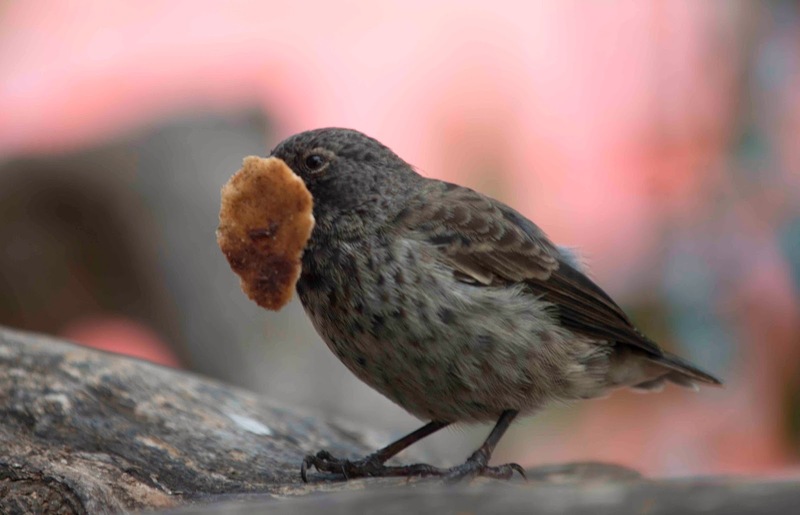 Our contribution to this story has been the study of two beak size morphs within a single species (the medium ground finch, Geospiza fortis) on the island of Santa Cruz. We (originally Jeff Podos, Sarah Huber, Luis De Leon, Antony Herrell, and myself) have shown that these large and small G. fortis morphs at one site (El Garrapatero) have a bimodal beak size distribution (many large and many small individuals with relatively few intermediates), have different diets, manifest different feeding performances (bite force), sing different songs, show different responses to songs, mate assortatively (large females with large males and small females with small males), experience disruptive selection (intermediate birds have lower survival), and show limited gene flow (based on microsatellite DNA). Stated plainly, these two morphs seem to be part of the way to becoming separate species, presumably through the same mechanisms as those that drove the radiation as whole. The two El Garrapatero G. fortis morphs. All of the above effects were demonstrated at a site (El Garrapatero) that is removed from any human settlements and therefore experiences little direct human influence (although indirect influences from introduced species are present). What happens when these two morphs – on their way to potentially become separate species – contact a growing human population? We were able to explore this question in a paper published in PRSB in 2006 by obtaining long term records (1964-2005) of G. fortis beak sizes from Academy Bay, a site immediately adjacent to the rapidly growing town of Puerto Ayora on Santa Cruz Island. This analysis was made possible through data collected by David Snow in 1963-1964, Hugh Ford in 1968 (data was being collected for me as I was being born!!! ), the Grants and their colleagues (1970s-1980s), and our own samples (2004 and onward). Analysis of these data showed that the beak size bimodality currently seen in G. fortis at El Garrapatero was also present at Academy Bay in the 1960s but not thereafter. The two morphs at Academy Bay thus seemed to have fused together into a single hyper-variable population in concert with the dramatic increase in human population density at that site. That is not a native food! 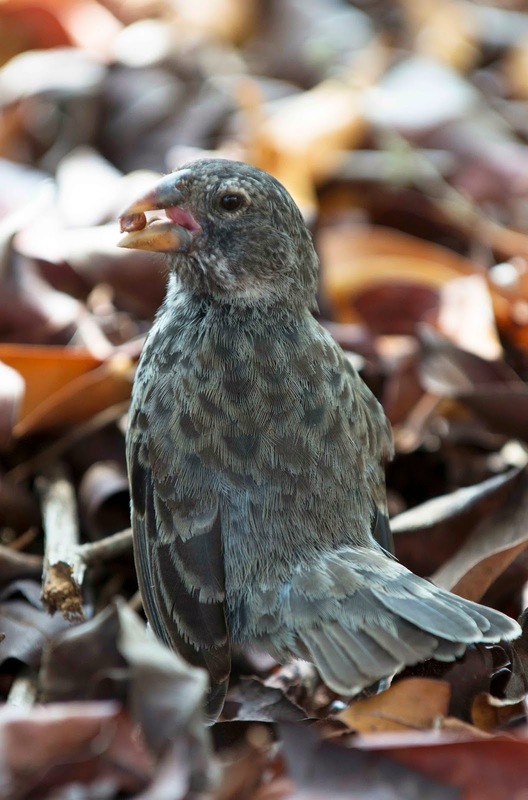 We proposed in the 2006 paper that fusion of the two G. fortis morphs at Academy Bay was the result of humans introducing food types that were accessible by finches of all beak sizes, thus turning the separate adaptive peaks into a long adaptive ridge spanning different beak sizes. On such a ridge, selection against intermediate birds should disappear and their increasing abundance should eliminate the bimodality. We provided support for this hypothesis in a paper in Evolution in 2011 that showed how the naturally strong (confirmed at El Garrapatero) associations between diets, beak sizes, bite forces, and gene flow that presumably drive finch diversification had all become weaker at Academy Bay. In short, humans were causing “reverse speciation” or “despeciation” by turning a formerly rugged adaptive landscape with distinct fitness peaks into a broad ridge without the gaps (fitness valleys) necessary to maintain species distinctiveness. This finding was where we left the story until recently. 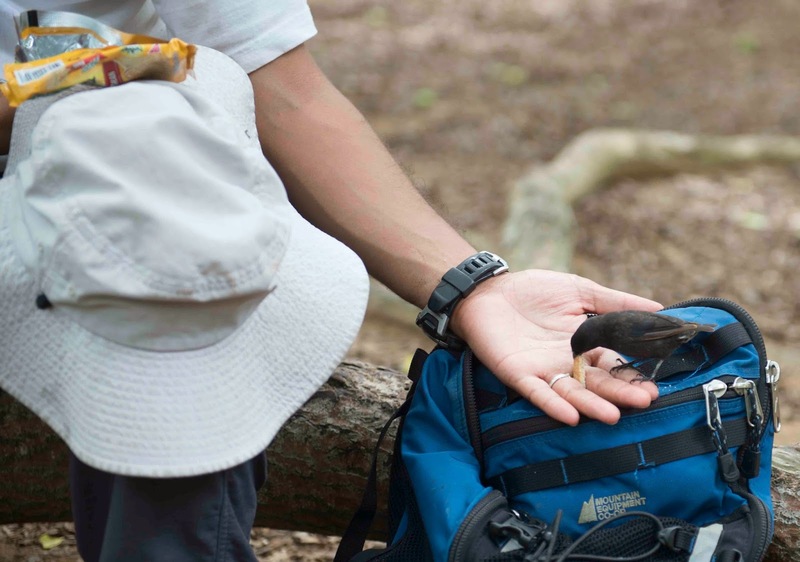 This year, we (spurred mainly by Luis) took up the problem again by making more extensive surveys in the town of Puerto Ayora to see how many finches were using human resources. Various teams of researchers and Earth Watch volunteers would walk through town in the mornings counting birds and determining what they were feeding on. Although I was already suspect the outcome, I was still rather shocked by how many finches were present in the town (more than in nature) and their incredible use of human foods – although they still found natural foods in vacant lots and gardens. I saw finches eating waffles, chips, plantains, rice, corn, fruit, ice cream cones, and many other items. 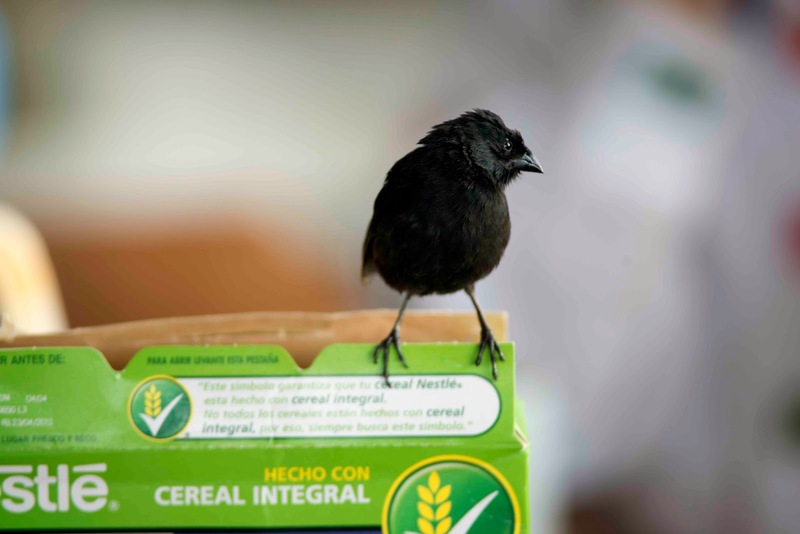 I thereby gained a personal confirmation of our original intuition that finches in Puerto Ayora (Academy Bay) had access to many food types that were usable by finches of any beak size. Then came the real kicker – at El Garrapatero. Dozens of finches of many species eating rice. We have been work at El Garrapatero for 12 years now. During that time, the site has transitioned from a difficult-to-access and rarely used site to a very popular destination for locals and tourists. The road has been paved and extended closer to the beach, the path to the beach has been cobbled, buses and taxis roar up and down the road, and gaggles of kids and adults play on the beach. My first hint of possible impacts was the appearance of non-native fruits (passion fruit) along the roadside. I was willing to accept that this would not have a major influence on finch evolution until recently. In 2012, we filmed Galapagos 3D IMAX – narrated by David Attenborough (no I didn’t meet him – but it was cool to hear him say my name on air) – at El Garrapatero. The film crew felt that our normal site, which was away from the beach, was not very picturesque – so they asked us to set up our nets at the beach itself. I was initially skeptical because we had never netted therefore and I couldn’t be sure we could get finches. However, we quickly caught lots of finches – they even seemed more abundant than at our normal site several hundred meters inland. And they seemed attracted to us. At one point, we were waiting to film something and noticed about 20 finches that landed right beside our banding station. We pointed this out to the film crew and they quickly swung their camera boom to film the finches at close range – this became the scene that opens the finch sequence in the film. We also saw several finches attacking the food we had brought for lunch. I was intrigued by this from a filming perspective but didn’t dwell on it much from the perspective of evolution. This year, however, my opinion changed. A few days ago, we walked with the Earth Watch volunteers down to the beach and came across a place where finches were everywhere. We sat down and they swarmed us. Jeff would crinkle a chip bag and they would come running. Then Luis would do the same in a different place and they would run over to him, jumping up on his bag and even into his hand in hopes of getting free handouts. Nearby, other finches of several species were fighting over some plantains someone had left out. It seems that the beach is now an accepted place to feed the finches. This got me to thinking that the direct human influence at El Garrapatero is increasing dramatically and that we might – in the near future – see impacts on the finch bimodality. In particular, we documented disruptive selection (selection against intermediate beak sized birds) in 2004-2006 before all these human changes were so dramatic. My prediction is that selection now will be less disruptive– and perhaps even less so in the future as human use of the site continues to expand. An El Garrapatero G. fortis enjoys a cracker - when it shouldn't. 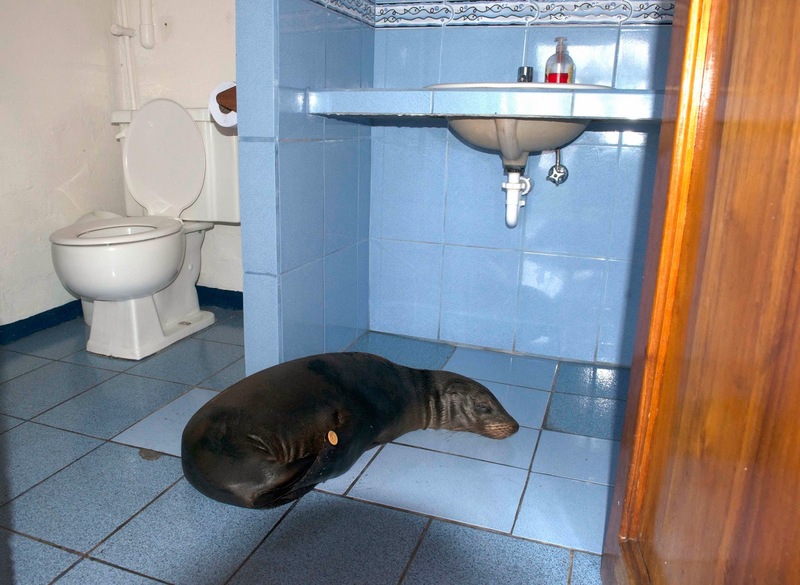 Evolution is coming undone in Galapagos. Human influences are pervasive in some places and they are expanding to new places. This is exciting as a scientist because we can now test evolutionary hypotheses using whole-ecosystem “experiments” – we can add humans and see how evolution changes. But it is depressing as a nature lover because a unique set of island life might well change dramatically. Finches will still be present, of course, but they might no longer be so diverse – at least not in sites where human influences are strong. Fortunately the government limits those impacts to restricted sites, leaving much of the archipelago free of direct human impacts (indirect effects can remain strong). This policy is reassuring because it would be a travesty if unique forms such as the “vampire finch” on Wolf Island were to disappear. I will report back in another decade or so. We were even besieged by finches during our breakfast (and they ate our chocolate bread, damn it). Thanks to our 2014 team so far: Diana Sharpe, Jaime Chaves, Kiyoko Gotanda, Joost Raeymaekers, Luis De Leon, Sofia Carvajal, Jeff Podos, and 16 Earth Watch volunteers. Galapagos 2014 videos: finches, marine iguanas, Sally Lightfoot crabs, lava lizard. My earlier post about the IMAX 3D filming of our research: Team Pinzones IMAX 3D. Kiyoko's blog from this year's Earth Watch expedition. Human influences on sea lion evolution?